Are your snow boots fashionable? Are they water-resistant too? If not, you can find plenty in the way of waterproof boots in Steamboat Springs at the Steamboat Shoe Market. The retailer offers waterproof premium brands, such as The North Face and Sorel. You don’t want to expose your feet to either cold temperatures or water. Otherwise, the fashion statement your boots are making will be quickly forgotten, especially if your feet are affected by frost bite. In the first stage of frost bite, the feet become very cold and sting and burn. The skin on the toes and feet turn a bluish-white or a grayish yellow hue. Muscle stiffness and blistering are side effects too. As the condition worsens, the skin turns black and dies. Therefore, it is well-advised to look for stylish and water-resistant boots that stand up to extremes in the temperature. 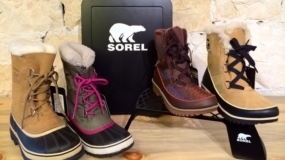 As mentioned, you can find waterproof boots in Steamboat Springs that are represented by such popular brand names as Sorel and The North Face. Indeed, the North Face brand exhibits the ultimate in water resistance in its boot’s materials. Seam sealing of the footwear safeguards the feet from melting snow and ice. Therefore, the North Face boot line offers boots that are as protective as they are stylish. The boots are slip-resistant too. To review all the selection of waterproof boots, visit the Steamboat Shoe Market or call them for further information. They can be reached at 970-871-8566.